At PCE Instruments you will find a power quality analyser to measure the power in W, kWh or to analyze and measure harmonics. This power analyzer is a multi-function power analyser device that measure precisely direct current, alternating current, AC-voltage, DC-voltage the intensity of DC or AC, phase rotation and idle, apparent and effective power. The reading of AC power is considered the real value and has a maximum range of 6000 Watts. While a reading is being taken, the polarity changes automatically, if negative values are taken then a minus sign will appear on the device display. Nowadays, power quality analysers have many features such as, insulated current input, measurement of harmonics, AC and DC current measurement, AC and DC voltage measurement, frequency measurement, phase rotation measurement and idle, apparent and effective power measurement. All this data can also be logged and analysed with the delivered PC-Software. Power analysers of the type PCE PA 6000 can determine the energy in single-phase systems. Power quality analysers of type PCE-GPA 62 allow the energy measurement in symmetrically loaded three-phase systems. Power analysers of type PCE-PA 8000, PCE-360 and PCE-830 support professional power and energy measurements in single and three-phase systems. Apart from being used as energy-measuring devices, power analysers like the PCE-830 can also be used for network analysis and the determination of harmonics and phase rotation. On our website you will find other power analysers used in the field of electronics. This power analyzer is used for single-phase or three-phase measurements of the active, reactive and apparent power, power factor, phase angle, energy, voltage, current as well as peaks and harmonics up to 50º of the harmonic waveform. The power analyzer clamp is equipped with data logger. The test instrument is delivered manufacurer calibrated (ISO or certification as an option). This power analyzer is used for single-phase or three-phase measurements of the active, reactive and apparent power, power factor, phase angle, energy, voltage, current as well as peaks and harmonics up to 50º of the harmonic waveform. The power analyzer clamp is equipped with data logger. The test instrument is delivered manufacturer calibrated (ISO or certification as an option). The PCE-360 is a Power Quality Analyzer with data logger functionality. This versatile power analyzer can take single-phase and three-phase power measurements both in real time and over an extended time period. The PCE-360 is a Power Analyzer with data logger functionality. This versatile power analyzer can take single-phase and three-phase power measurements both in real time and over an extended time period. PCE-PCM 1 is a multipurpose power analyzer used to measure alternating current (AC), voltage (TRMS) and frequency to determine active (kW), apparent (kVA) and reactive (kVAR) power as well as active energy (kWh) consumption. 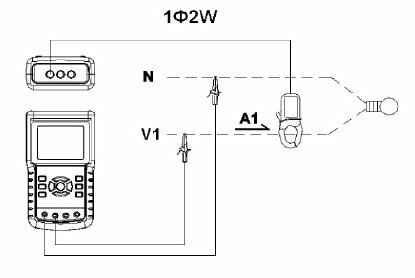 Both the phase angle and the power factor (cos φ) are shown on the handheld power meter's large and easy-to-read backlit display. The PCE-830 Power Analyzer is used for measuring one to three phases of electrical quantities for alternating current (AC). This Power Analyzer also measures parameters such as voltage, current, frequency, harmonics, and power as well as indicating, according to standard EN50160, harmonic values, interharmonics, and asymmetrics. Interference, such as interruptions, leaks, overloads, or transience (from 16 µs) are detected with their corresponding values. The power logging instrument is delivered manufacturer calibrated. An ISO calibration certificate may be ordered optionally. The PCE-830 Power Analyzer is used for measuring one to three phases of electrical quantities for alternating current (AC). This 3-Phase Power Analyzer also measures such parameters as voltage, current, frequency, hrmonics and power as well as indicting, according to standard EN50160, harmonic values, interharmonics and asymmetrics. Interference, such as interruptions, leaks, overloads or transience (from 16µs) are detected with their corresponding values. The PCE-830 Power Analyzer is used for measuring one to three phases of electrical quantities for alternating current (AC). This Power Analyzer also measures such parameters as voltage, current, frequency, harmonics and power as well as indicting, according to standard EN50160, harmonic values, interharmonics and asymmetrics. Interference, such as interruptions, leaks, overloads or transience (from 16µs) are detected with their corresponding values. The PCE-830-3 Power Analyzer is used for measuring one to three phases of electrical quantities for alternating current (AC). This Power Analyzer also measures such parameters as voltage, current, frequency, harmonics and power as well as indicting, according to standard EN50160, harmonic values, interharmonics and asymmetrics. Interference, such as interruptions, leaks, overloads or transience (from 16µs) are detected with their corresponding values. PCE-PA 8000 is a portable handheld power analyzer used for the testing and inspection of 3-phase / 4-wire, 3-phase / 3-wire, 1-phase / 2-wire and 1-phase / 3-wire electrical circuits. This handy power quality analyzer not only measures multiple electrical properties in real time, but also saves the measurement data in .xls format to the included SD card memory for quick and easy data transfer and analysis using Microsoft Excel. - Built-in data recorder with adjustable sample rate: 2 ... 7,200 sec. - Built-in data recorder with adjustable rate: 2 ... 7,200 sec. The power analyzer PCE-PA6000 power analyzer can be used as a desktop or portable instrument for measuring active power, apparent power, power factor, energy consumption, AC voltage, AC current, DC voltage, DC current, resistance and frequency. The power / performance measurement can be performed with this power analyzer either directly with the supplied test leads, or indirectly by current clamps. The EasyCount three-phase Power analyzer is an energy meter embedded in a case protected against water, for three-phase current up to 400 V. The wires of the three-phase Power analyzer, with a length on both sides of approx. The power analyzer PCE-P43 is designed to take measurements and transfer measurement data of 3-phase power networks. The power analyzer can be connected to symmetrical and asymmetrical systems. The CA-MA200-17 Mini Power Analyzer can measure AC currents from 0.5 A to 300 A with a 1 MHz bandwidth, and features a BNC connector for oscilloscopes. Whether the current is to be measured in control cabinets, junction boxes, or on tracks, the miniature CT MA 200, with its flexible current loop, is a way to measure the current with a bandwidth of 1 MHz. Thanks to the BNC output of the miniature CT MA 200 it may be directly connected to an oscilloscope. The test meter comes manufacturer calibrated with ISO certification as an option. The CA-MA200-25 Mini Power Analyzer can measure AC currents from 0.5 A to 300 A with a 1 MHz bandwidth, and features a BNC connector for oscilloscopes. Whether the current is to be measured in control cabinets, junction boxes, or on tracks, the miniature CT MA 200, with its flexible current loop, is a way to measure the current with a bandwidth of 1 MHz. Thanks to the BNC output of the miniature CT MA 200 it may be directly connected to an oscilloscope. The test meter comes manufacturer calibrated with ISO certification as an option. The CA-MA200-35 Mini Power Analyzer can measure AC currents from 0.5 A to 3000 A with a 1 MHz bandwidth, and features a BNC connector for oscilloscopes. Whether the current is to be measured in control cabinets, junction boxes, or on tracks, the miniature CT MA 200, with its flexible current loop, is a way to measure the current with a bandwidth of 1 MHz. Thanks to the BNC output of the miniature CT MA 200 it may be directly connected to an oscilloscope. The test meter comes manufacturer calibrated with ISO certification as an option. The CA-B102 Power Analyzer is designed for fast location of insulation faults. The Power Analyzer has a maximum diameter up to 112 mm (4.4 in), and can be used with multimeters. Two selectable measuring ranges are available to allow for precise measurement according to DIN VDE 010. When looking for a power quality analyzer or power measuring device, the question about application comes first. Here it is important to distinguish whether a temporary measurement or a continuous long-term measurement should be carried out with a power quality analyser. Furthermore, it must be found out whether it goes about 1-phase or 3-phase measurement. 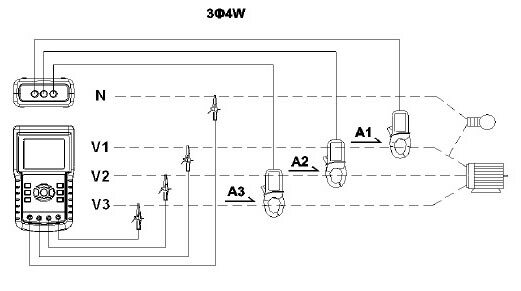 In the 3-phase power measurement, it is also necessary to differentiate between symmetrical and asymmetrical power measurement. In principle, power quality analysers which are used for 1-phase measurement can also be used for 3-phase applications if the load is symmetrical. This is because the current taken off at all three phases is always the same. The power quality analyzer then calculates the total power itself. In the power quality analysers for single-phase measurement for permanent installation, a multiplier for the displayed measured value can be deposited and the display will always show the correct measured value. The power quality analysers for this application are often kept very simple and are used only for temporary measurement. They have no memory and a measuring range is relatively limited. Multiple phase power quality analyzers have at least 3 current clamps or Rogowski coils to measure the current through the connecting cables of the phases. These power quality analysers are often used for permanent monitoring of network parameters. For energy audits or for determination of energy needs of the industrial companies, power quality analysers are indispensable. As well as the power quality analysers for single-phase applications, these power quality analysers also have voltage measurement cables that are connected directly to the terminal points. The power quality analyser measures then, in combination with the current clamps, the parameters: current, voltage, mains frequency and phase angle. From these parameters, the three-phase power quality analyzers then calculate all power parameters such as active, apparent and reactive power. Power quality analysers of this type are usually equipped with a memory function / data logger. The datalogger enables continuous storage of the network data, thus helping to determine the energy needs or consumption of machines and systems. The memory is then often read out via a corresponding reading software. Besides, there are also power quality analysers available that store the measurement data on a SD memory card. This simplifies the analysis of the measurement data to such an extent that no other software is needed for tabular measurement data evaluation. Another extension level of the power quality analyser is the network analyzer. Power quality analysers with network analysis function are based on the principle similar to the "normal" power quality analysers. However, the network analyzers possess, as another option, the function of determining the network distortion / harmonics. Simpler network analyzers can determine the harmonics up to the 25th order. High-quality power quality analysers with network analysis function can easily do this up to the 50th order. In addition, these power quality analysers can determine start-up currents, flicker, DC components, etc. These power quality analysers also have a memory that can be evaluated by the user. power quality analyzer Clamp or Rogowski coil? At the beginning of this purchase advice, we briefly mentioned that there are power quality analysers with current clamps and / or Rogowski coils. What is the difference between them? The difference lies essentially in the design. A current clamp is rigid and can be successfully used anywhere where there is a possibility to easily access and measure the current-carrying power of a machine or system. Current clamps are often used for measurements when the currents that should be measured by the gauge are relatively low. Current clamps can usually be used at maximum 1200 A per phase. Due to the rigid design, current clamps are rather difficult to use in sub-distribution and control cabinets. For this purpose, power quality analysers with flexible Rogowski coils are applied. This power quality analyzer is excellently suitable for power measurements where the space for current clamps is insufficient. Furthermore, the coils can be used for significantly higher currents per phase. So, Rogowski coils can accurately determine up to 10,000 A. Should you have further questions about our power quality analysers, our technicians are always ready to provide help and advice under our phone number: +44 (0) 2380 987 035 for PCE Instruments UK or +1 (561) 320-9162 for PCE Americas Inc. If you have a special application need, it will be our pleasure to consult you and find the right power quality analyser for you. In the power measurements of voltage networks, power is the result of the formula P = U * I; which means the product of the voltage U and electric current I. In the case of measuring alternating current (i.e. line voltage of 50 Hz) a phase angle between current and voltage is generated. You should take it into account in measuring effective power. Therefore, the power quality analyzer shows the combined measurement of electrical power, a tour of the voltage and current. The value P (effective power) is equivalent, as described above, to the product of both values. In general we have to differ between two measuring methods. direct current measurement: For this current measurement, the circuit must be opened. It is not possible to measure in an active circuit. indirect current measurement: The current is measured by a current transformer clamp. This can be easily clicked around the wire. It is not necessary to open the circuit. All PCE power quality analysers provide the indirect measurement system. Power Analysers are available as several types and versions. Depending on the field of operation, several Power analysers are advisable. 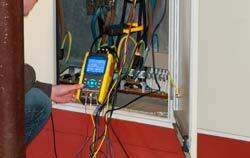 For maintenance and inspections power analysers with clamps are available. These power analysers will measure current indirectly so you don't have to take action in the current circuit. Electric power is able to be measured and described with power analysers, too. Three phase power quality analysers are able to measure simultaneously via power analysers with three clamps. The possibility to measure power is also given with several special constructed power analysers. These power analysers are not only able to measure power but also values like current, voltage and resistance. Power analysers are available for mobile needs and stationary operation for example in form of laboratory power analysers. In General the Power analysers are used to measure the power and to calculate the energy cost depending on the measurement. Other Customers measure the output from a transformer and the decide if they can add on more devices on the transformer or not. In the past couple years the Power analyser are also used in the photovoltaic area.